Mookie Betts of the Boston Red Sox hits a solo home run to complete the cycle in the ninth inning during MLB game action against the Toronto Blue Jays at Rogers Centre on August 9, 2018 in Toronto, Canada. Mookie Betts homered in the ninth inning to complete his first career cycle during the Toronto Blue Jays' 8-5 win over the Boston Red Sox on Thursday night. Betts is the 21st Red Sox player to hit for the cycle. He singled and scored in the first inning, tripled in the second and doubled in the fourth against starter Ryan Borucki. After walking in the sixth, Betts hit a one-out drive off Ken Giles in the ninth for his 27th homer of the season. 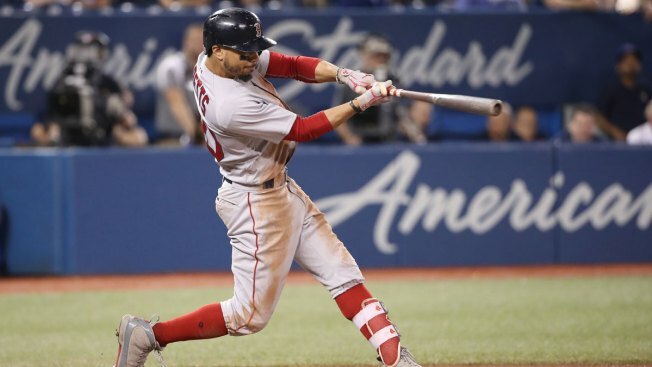 Betts is the first Boston player to hit for the cycle since Brock Holt in 2015. Betts, Holt and Leon Culberson in 1943 are the only Red Sox to cycle from the leadoff spot. The AL MVP candidate raised his average to .347 on the season with 59 RBIs and a 1.102 OPS. He celebrated his no-doubt homer by lifting a fist and smiling at Boston's dugout. Boston starter Rick Porcello (14-5) allowed seven runs and six hits in four innings. Porcello lost for the first time since a July 13 home defeat to the Blue Jays, a game in which he allowed a season-worst eight earned runs. The right-hander is 1-2 with a 9.15 ERA in four starts against Toronto this season. Borucki (2-2) allowed four runs and a career-worst nine hits in five innings but won his second straight start. Borucki pitched eight shutout innings to beat the Mariners for his first major league win in his previous outing.